This program is only available to individuals from 18 years or over and is a citizen of Vietnam with ID, foreigners having passports, and children up to 12 years old. 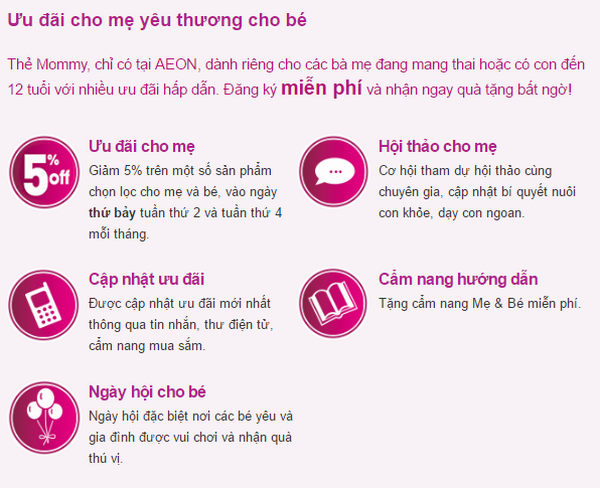 It is not applicable to employees of AEON Vietnam Ltd and may not be used for any commercial purposes. Customers who sign up for the program will be given a free Mommy Card at their Customer Service Desk. Each customer owns only one (01) card number code. The card still remains the property of AEON Vietnam Ltd. (AEON) after being given to the customer. In case of losing the card, please contact AEON Customer Service Desk to complete the procedure for card re-issuance at the cost of 20,000 VND / card. Members show Mommy cards (or bar codes) to get 5% discount for selected items of mom and baby at the AEON Department Store and Supermarket on Saturday, 2nd and 4th week of each month. Members will be able to participate in two festivals of the year, receive gifts as soon as they are registered, receive promotional messages and other special programs exclusively for members. Please show your Mommy Card and ID / Passport when you receive benefits or carry out the related paperwork. Modify or terminate the Mommy Card program. Refuse to issue Mommy Card. Retrieve or cancel Mommy Card for good causes. Good causes include the customer's use of the Mommy Card Program in all its forms for purposes that are inconsistent with the terms and conditions of this program or in case AEON has any doubts about honesty of customers in using Mommy Card. AEON is not responsible for handling customer rights if the information provided by the customers is incomplete or inaccurate, or if the time limit for receiving benefits is not specified in the program and does not take any responsibility arising from the damaged or misplaced Mommy Card. AEON is allowed to use the information contained in the registration form and all data related to the purchase of members at the AEON department store and supermarket system to support direct marketing activities, statistics and program management. All data related to the members will be kept confidential. The card is valid for up to 3 years from the date of registration. This time limit shall be terminated immediately at the time when the customers do not meet the requirements mentioned in Section 1 above.